If you're thinking of starting an herb garden or already have one, you've probably discovered that dozens of different plants are available. As you make your choices, paying attention to plant leaves can help you identify each one and also help you manage your planting area when "volunteer" seedlings appear from time to time. Leaf characteristics include shape, color and texture, the number of leaf blades that make up each leaf and other features. Leaf color and shape can vary a great deal for herb plants; they might be round to oval, or thin and narrow, and aren't always green. For example, basil (Ocimum basilicum) has smooth, green, broadly oval leaves with pointed ends. Some cultivars have leaves with purple overtones, including the variety "Purple Ruffles" (Ocimum basilicum "Purple Ruffles"), whose leaves are also crinkled and ruffled. Basil grows as an annual in all parts of the United States. Rosemary (Rosemarinus spp.) is another example of an herb whose leaves stand out because of their shape and color. They are grayish-green and quite narrow and pointed, surrounding its tall, graceful stems. 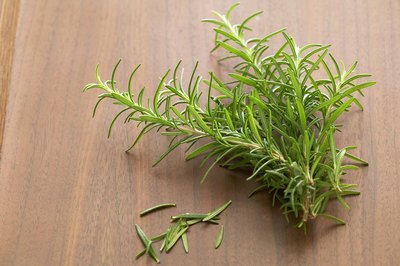 Rosemary is a perennial that has two growth habits: the upright form, "Salem" (Rosmarinus officinalis "Salem"), which grows in U.S. Department of Agriculture plant hardiness zones 7 through 10, and "Prostratus" (Rosmarinus officinalis "Prostratus"), a creeping type that grows in USDA zones 8 through 10. When an herb plant has leaves made up of a single blade, these are called simple, while those with compound leaves have leaves composed of several blades, or leaflets. If these are attached along a central stalk, they're pinnately compound; if leaflets are attached to the end of the stalk, they are called palmately compound. For example, the herb German chamomile (Matricaria recutita), which grows as an annual in all parts of the United States, has compound, double pinnate leaves with a delicate, fernlike appearance and white, daisylike flowers. 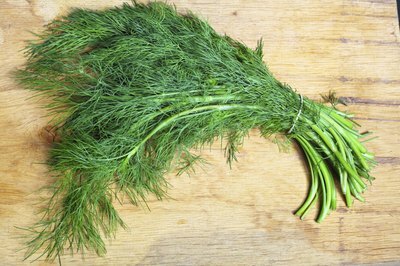 Dill (Anethum graveolens) is another herb plant that has compound leaves, but these are made up of extra-fine, threadlike leaflets that are a distinct, blue-green color. It's also an annual plant in all parts of the United States. Certain herb leaves have texture that makes them distinctive and helps in plant identification. The sage variety "Berggarten" (Salvia officinalis "Berggarten") is one example that's a perennial in USDA zones 5 through 8 and can also grow as an annual elsewhere. It has large, round, gray-green leaves with dusty surfaces that seem to be sprinkled with powder. The mullein plant (Verbascum thapsus) also has leaves with interesting surface features. Its tall stems are surrounded by basal rosettes of gray-green leaves that can be up to 15 inches long, each with a softly fuzzy, or hairy, surface that makes the leaf resemble flannel cloth. 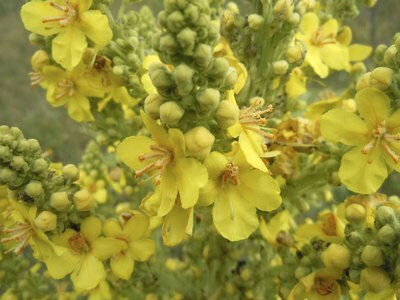 Mullein grows as a biennial in USDA zones 3 through 9. 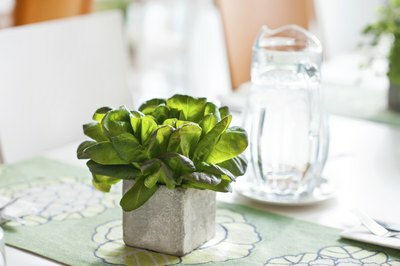 Some herbs have one-of-a-kind leaves that give the plant a unique, easy-to-remember appearance. 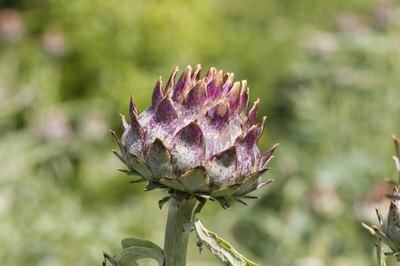 Cardoon (Cynara cardunculus) is a good example that has gray-green, arching leaves that divided into pointed lobes and have jagged, sharp edges. It has purple, thistlelike flowers in summer and grows in USDA zones 7 through 9. The chive plant (Allium schoenoprasum) is another herb with unusual, highly distinctive leaves that make the plant immediately recognizable. Each leaf is dark green and grasslike, becoming up to 1 foot long. Leaves are also tubular and hollow, resembling little cylinders when sliced into segments. The chive plant grows from a bulb and is a perennial in USDA zones 4 through 8.